The Bancroft students had two projects in the spirit of giving this holiday season. In their own simple but creative ways, our students sacrificially showed their gratitude to our troops and joyfully shared their talents to the elderly. 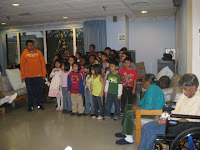 "Carols to the Elderly"– On December 19, 2008 before the winter break, students visited and sang Christmas carols at the Stoddard Baptist Nursing Home. It was such a great joy to see the smiles from the elderly people as they heard Christmas songs from our students. The project was also a good opportunity to teach students the value of respect for the elderly which is an important part of the Asian culture. 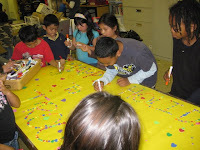 All our Elementary students received their Christmas wish during our AALEAD Holiday party last December 20, 2008. Santa with his elves (all AALEAD student volunteers) distributed the gifts to our Elementary students. We are grateful to our sponsors who served as the secret Santas for these kids. 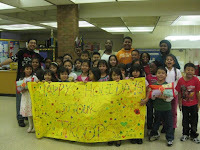 The Thomson students also had an opportunity to participate in the OAPIA Toy distribution last December 16, 2008. 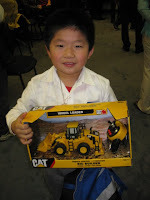 18 students gratefully received toys from the Office on Asian and Pacific Islander Affairs.